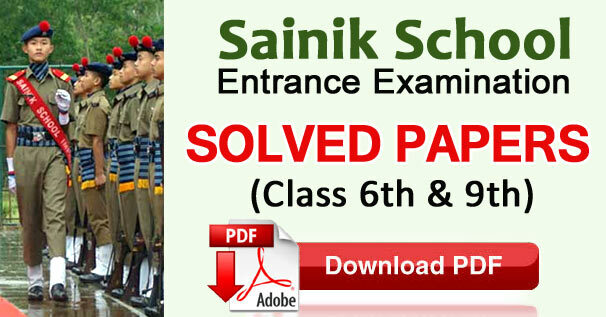 Sainik School Solved Papers - Sainik School Entrance Exam (SSEE) is held in January every year for Class VI Admissions in Sainik Schools across in the country. Total number of students appearing for Sainik School Entrance Examination is one lakh. The students aspire to forge ahead of the rest of the peers Admission to Sainik School is sought after as from the beginning, it gives the students a stable career. Everyone who have wish to appear to the Sainik School 6th Class admission selection test they can Download the Hindi and English Medium Previous Exam Solved question papers from the old examination question bank to guessing examination pattern with important questions. There are two papers in the written examination. Paper I consists of Mathematical Knowledge Test and Language Ability Test (English), Paper II comprises General Intelligence Test. Mathematical Knowledge Test Arithmetic forms the bulk of questions and sometime complex calculations are required to arrive at an answer, though most of the time simple calculations are enough to get the answer. The paper is split as follows: 40% of the questions are from Arithematics, 20% are from Algebra, 25% are from Geometry and 15% are from Mensuration. Language Ability Test (English) Grammar forms the bulk of testing material in English. Around 40% of the questions asked are from applied grammar. About 20% of the paper tests synonyms and antonyms. Sentence arrangement and comprehension form 40% of the paper. In English, grammar is important as it comprises a vast portion of the paper. There is a passage for comprehension and it is generally of obtuse nature. There are questions asked in form of fill up the blanks. General Intelligence Test In this section question are arised from Verbal and Non-Verbal.